Last night’s crushing parliamentary defeat of the Prime Minister Theresa May’s Brexit plans highlighted as never before just how much Parliament, and indeed the nation is divided over leaving the European Union. Two years of bitter negotiating with the EU and her own party have led us no nearer to any final agreement. Where do we go from here? No one quite knows. Parts of the world look in both amusement, and horror, how a once proud nation has descended in politically tearing itself apart. The stakes couldn’t be higher; the consequences couldn’t be more serious. To better understand how and why this political endeavour is causing such pain and division we need look no further than the empire’s elephant in the room. 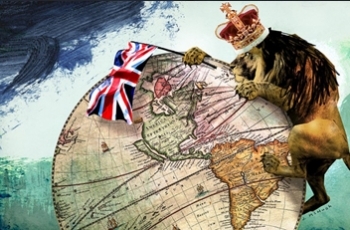 The architects of Brexit, Nigel Farage, Liam Fox and Boris Johnson have based their ideological premise that the United Kingdom was one of the most powerful and far reaching empires the world has ever seen and according to them there is no reason, why the UK cannot begin to regain some of that prestige again through what some Brexiters described as project Empire 2.0. We used to run the biggest empire the world has ever seen, with a much smaller domestic population and a relatively tiny civil service… Are we really unable to do trade deals?" 178 nations of the world we either conquered or invaded”. This empire and war rhetoric was then used effectively in reverse in a project of fear a loathing that no rational opposition debate could compete with. Farage, Johnson and others relentlessly told the public that we are being, ‘invaded by foreigners’ – shamelessly depicted by the infamous Nigel Farage ‘breaking point’ billboard poster which showed tens of thousands of foreigners/refugees seemingly on their way to the UK. The other xenophobic devices were to tell the public, ‘We are being run by foreigners in Brussels’. Johnson was even more jingoistic ; telling anyone who would listen that the UK has become ‘a colony to the European Union’. Putting aside the utter disrespect and disregard to what African and Caribbean nations faced under brutal British colonial rule, sowing the seeds of hatred and division on xenophobic grounds has ruptured our societies from those who see us as international, multicultural, inter-collaborative nations , to those who want to see our world through the lens of ‘Empire 2.0’, the Empire striking back. Of course, the two ideological ideas are irreconcilable, and as a result on whatever side you believe in passions run very deep. Whilst it has been and probably still is a small percentage of BME voters who voted for Brexit- some were duped into believing that Britain would open its doors to Black commonwealth countries, whilst others shamelessly thought, ‘I’m okay, let’s stop the rest coming in’, but in reality BME communities -75% -85% voted to rejected Brexit, not least because we knew once the xenophobic genie is out of the bottle, then we’ll be the first to catch hell fire. What now? Maybe it’s time we were more vocal about where we think the country is heading and what we expect from our elected representatives. What is crystal clear is that what is being played out now will affect us for a generation or more.